If you plastics supplier is wholely located under one roof, then they are limited and so are you.Whether we deliver parts to your final assembly facility in China or ship the molds to USA. Our China and USA tool making facilities give us a global footprint. Made where is makes sense. Influenced by our "manufacture where it makes sense" thinking. We look at the question through the lens of what is most beneficial for our customers. 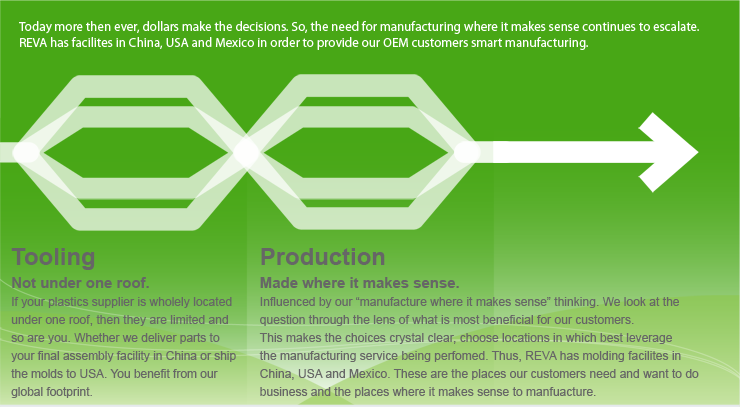 This makes the choices crystal clear, choose locations in which best leverage the manufacturing service being perfomed. Thus, REVA has molding facilites in China, USA and Mexico. These are the places our customers need and want to do business and the places where it makes sense to manfuacture.